Friends of Northside is an initiative of Attack Poverty. Our mission is to strengthen under-resourced communities, such as the Northside area in Houston, through spiritual growth, education, revitalization and basic needs. 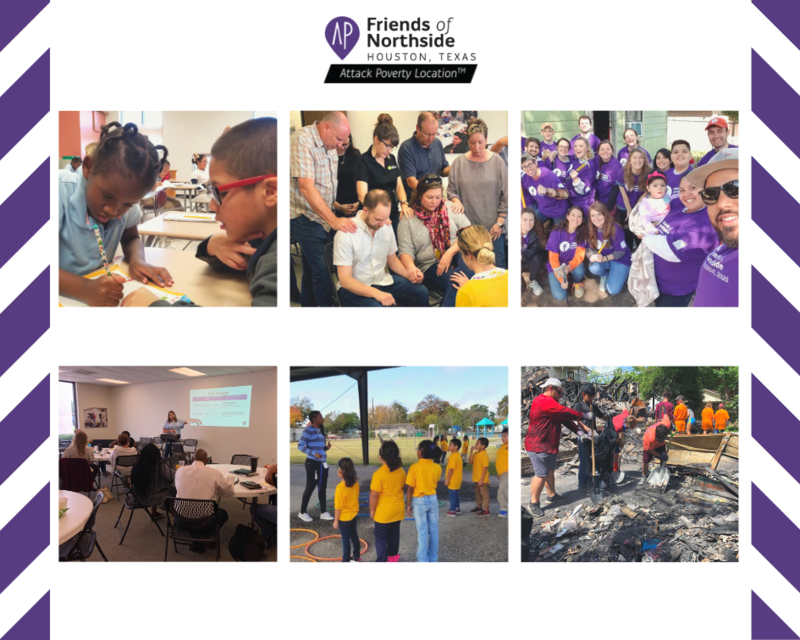 There are many reasons why people volunteer with Friends of Northside. First, a volunteer would get the opportunity to give back to an organization dedicated to impacting people's lives. Second, the volunteer gets to be part of building community. Through volunteering, one is able to support families, improve education, and encourage young people to believe in their dreams. Third, the volunteer will be part of a valued team. And finally, it feels good to know that we are making a difference in God's Kingdom and doing His Will. Help lead children from ages 5-11 in Sports Activities, Bible lessons, and lots of fun. To volunteer with children you must sign up before May 15 in order to run a background check. Help lead students from ages 11-17 in Sports Activities, Bible lessons, and lots of fun. To volunteer with children or youth, you must sign up before May 15 in order to run a background check. Whether you can swing a hammer or not sign up to volunteer! This MIGHT include painting, debris removal, sheet rock repair, roof repair, fence repair. List of all supplies and jobs skills will be communicated. Age 14 and under may volunteer with parent present! Help us in providing meals to all participants and volunteers. This volunteer job requires that you distribute food with love. Help us get to know our community better by hitting the pavement and talking to neighbors. Street / Prayer teams will go door to door to survey neighbors with the intent to become more intentional with our future programming. If the opportunity presents itself, volunteers will pray with the homeowner. Your smiling faces will get to greet all volunteers and community residents as they walk into our event. Volunteers will be responsible for checking in registered volunteers and participants. They will help us distribute Mission Week T-shirts as well as assist and register walking-ins. We are partnering with Memorial Hospital and Mutual Omaha Bank in order to provide Health and Finance Classes for all our residents. Volunteers will help us coordinate and assists participants throughout the class. Take Pictures/ videos of the children, youth, volunteers and all of the activities that are going during kid’s camp, youth camp, adult classes, street teams, and home repair activities. We are also looking for someone to take footage with their drone. We would also like to see an edited recap video for our Celebration Service on Wednesday June 5th. Another way to partner with us is by giving to our cause. $10, $20, $100 or more allows us to serve the community and not take funds from our regular programming budget.